Happy Monday Coug Nation. Hope you all enjoyed a sunny, relaxing July weekend. But don’t get TOO relaxed….training camp is coming, now just what, three+ weeks away? Time sure is flying by. First of all, one last quickie on “lil’ Romeo” Pellum. We apologize if the untrustworthy part of the headline on Friday was misinterpreted by any of you. It could be a bit misleading, or even thought of as calling the coaches out as not being trustworthy, etc. Or, it could even be taken as giving too much credence to Pellum and what he thinks of the WSU program. None of these things were the intent. 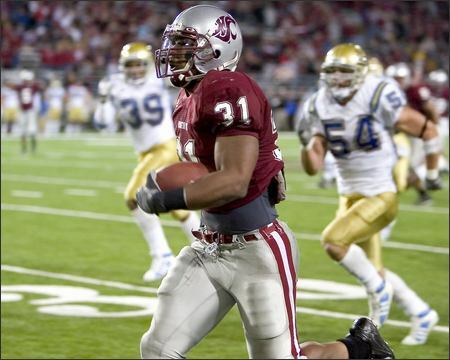 And to make things worse, we heard a few things about Romeo over the weekend that, uh, let’s just say him leaving Pullman is the best thing for everyone. But it’s over and done with, and we all will now move on. That said, it’s still a slow time in the Coug universe. So we’ll plow ahead with a peek at the O-line for ’09, WSU Football Blog style. First of all, the ’08 line was, well, battered. How’s that? Battered to the extent of a seemingly never-ending shuffle of linemen, in and out of the lineup. All told the offensive line started eight different combinations last year, with players in and out of the lineup on a weekly basis. The good news is that some young players got their feet wet, and, towards the end of the season anyway, things started to settle down. The last three games of the year saw the exact same starting five up front, and even all in their regular positions! How about that!? But it was THAT fluid up front. With that revolving door came the best teacher of all – in-game experience – but it also came at a steep price. We saw the beatings that the QB’s took last year, where Gary Rogers, Kevin Lopina, and Marshall Lobbestael all dealt with major pain. Of course, Rogers and Lobbestael were knocked out for the season, while Lopina missed several games in the middle of the year with the vertebrae fractures. Even Dan Wagner, the fourth QB, was hobbled a bit later in the year, and although J.T. Levenseller barely played, HE TOO was beat up when he was in there! All told, the WSU QB’s ate it to the tune of 42 sacks (PAC-10 worst), plus numerous hits on the QB that might not go down in the stat book. It was a group that was trying to learn new schemes, from new coaches, with new players in and out. Doesn’t exactly add up to success, does it? But that’s ’08, and it’s in the rear-view mirror (thank God). Time to look forward to a new era. And there is, potentially, some positions to feel really good about. Live in the past, stay in the past, right? So let’s see how the ’09 line might look…. Decent size for tackle at 6-4, now up to 315 lbs, the sophomore-to-be should be a mainstay on the line for the next several seasons. 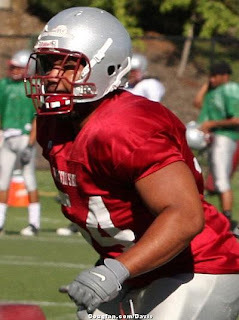 He played in eleven games last year as a red-shirt frosh, including five starts, shuffling between guard and tackle. He played more guard than anything last year, in fact he had just one start at tackle for the entire season. So, starting left tackle will be a new deal for Ayers. Of course, brand new left tackles can make people nervous, you know, with the whole protect-the-QB-blindside stuff? But Ayers has that rookie season out of the way and sounds as if he’ll be ready for the challenge. Originally thought of as a potential heir-apparent to Vaughn Lesuma at left tackle, instead Williams will roll with the starters at left guard. Williams has been regarded as one of the most talented linemen on the team since he set foot in Pullman for his redshirt season last year, and was often mentioned by Wulff during radio shows and interviews that Williams looks like he could be a real player. He’s also mentioned as having a real tough streak to him, something this offensive line could really use in bunches right now. It will be awfully interesting to see how Williams does out of the chute. Not your typical JC transfer in that he actually has a red-shirt season at WSU under his belt, but still, this will be his first BCS action of his career. It’s one thing to do it in practice, but let’s hope his early buzz continues into September, and beyond. The best lineman on the team, heck, probably the best player on offense to line up next year, Alfred has it all. 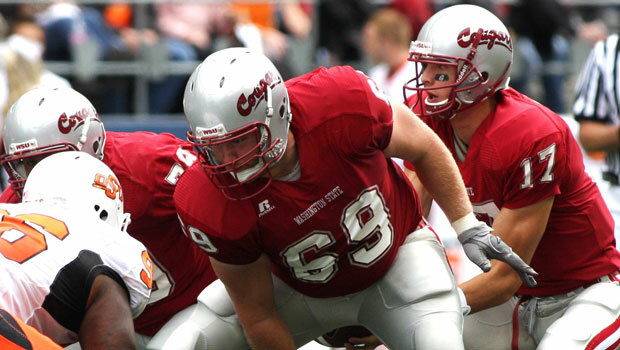 Smarts (All-Academic team), experience (32 career starts coming into ’09), and toughness(winner of the Mike Utley lineman of the year award last year), he’s pretty much everything WSU could hope for at center. 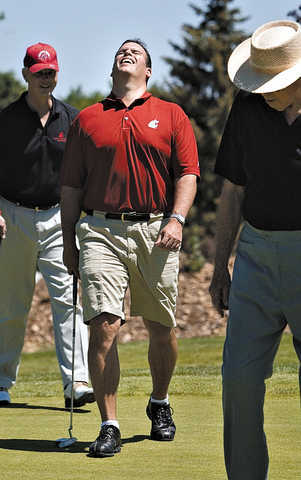 He’s been pegged as being a good one since he first came to Pullman under Bill Doba’s watch, who once predicted Alfred would be a four-year starter back in ’05. And here we are. He’s on all the pre-season watch lists for offensive linemen, and rightfully so. A little worrisome is the hip injury that forced him to miss the entire spring practice session, but word is he is A-OK and will be ready to go next month. As center is really the quarterback of the offensive line, there is very little doubt that Alfred is the one guy they need to have out there on a weekly basis. Guerra has been up-and-down a bit, hasn’t he? Thrown to the wolves in ’07, he held his own as a backup, and then saw a lot of action last year, starting five games. Those five starts included the last three games of the year, when the WSU line had the same starting five for three consecutive games, the longest stretch of the season where the same five started a game. Originally a d-tackle when he came to WSU, he was switched over to the offense his red-shirt season and hasn’t looked back. He’s got some size (6-3, 311) and a little nastiness to him, a quality needed for this group. Similar to Alfred, Hannam is the other leader up front. Another brainy guy, named to an All-Academic team in each of the last two years, Hannam has some major experience as well. He has now started 25 consecutive games, all at right tackle. While not your NFL prototype tackle at 6-4, 284, he’s still strong and moves pretty well. 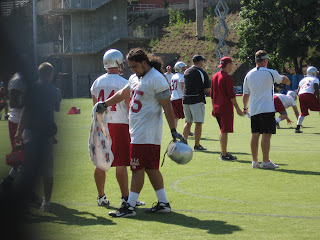 Also like Alfred, Hannam missed all of spring drills due to injury, but, everything sounds good for the start of camp. The backup offensive tackles will likely be Joe Eppele and Tyson Pencer. 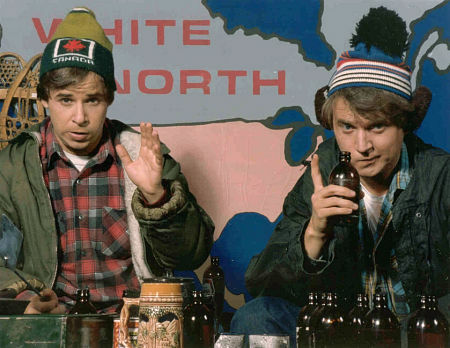 Both are enormous Canadians, hailing from the great white north province of British Columbia. Eppele’s at 6-8, 306 and Pencer at 6-6, 297. But they are green, Eppele with two starts, Pencer with none as he is just coming off his red-shirt frosh season this year. Eppele is another smarty pants, placing on the second-team All-Academic PAC-10 squad for two straight years. While he only started two games last year, he did see action in 10 games total. Inside, you will likely find Brian Danaher and Andrew Roxas as the backup guards. Danaher is a lunchpail-n-hardhat type, not a spectacular athlete but gives you all he’s got. He’s perfectly slated as a backup, but he still started EIGHT games last year. That’s some good experience to have in there, and he’ll be ready when called upon. Andrew Roxas, like Danaher, is also experienced, starting eight games himself last year. 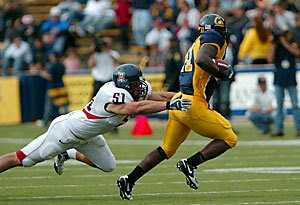 Roxas made a name for himself in 2007, when he stepped in as a frosh and started for the injured Kenny Alfred vs. UCLA. 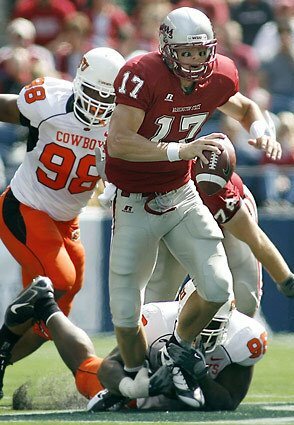 The result was a 27-7 victory at home that saw the Cougs run for 274 yards on the day, by far the season high in ’07. Roxas has basically been a backup at center and guard ever since, and that’s where he’ll open up ’09. So that’s a look at the starters, plus some key backups. Now here’s something else to think about – remember that NO HUDDLE OFFENSE we heard so much about when Wulff was hired?!? No? Neither do I. That’s because we barely saw the thing after the first game of the year. Once the injuries started to mount, forget it. But it wasn’t anybody’s fault, really. The whole idea was just too much, too soon, for everyone on offense to handle. But not anymore. It’s been said repeatedly that 2009 will see the “real” WSU/Todd Sturdy offense, and that involves a fast-paced, no-huddle scheme that is aggressive from the get-go. Now that we’ve seen a season in the books for all these guys involved, all in this new scheme, we’ll finally get a chance to see the real deal. Will the no-huddle give everyone a chance to show what they can really do? Is the O-line up to the task? 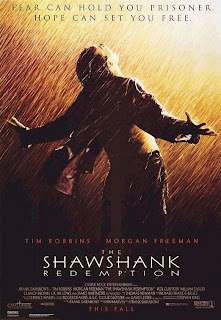 The beauty is that we are going to find out! So what do you think of the O-line? It looks pretty good…today…on paper. But we’re still quite a ways away from Stanford on 9/5. That’s about it for a Monday. Enjoy heading back to the grind, and as always, GO COUGS! You are currently browsing the archives for the Zack Williams category.